Are you interested in yogic relaxation for stress relief? Yoga is an increasingly popular activity for relaxation, and it comes with many other benefits too. In this guide to yogic relaxation, you’ll learn everything you need to know about it. We’ll look at why yoga is effective for relaxation, some techniques you can begin using and research behind the benefits of yoga. Read on or skip to the section you’re most interested in. 1. What Is Yogic Relaxation? 2. Yogic Relaxation For Stress. 2.1. Why Is Yogic Relaxation Effective For Stress? 3. How Do Yogic Relaxation Techniques Reduce Stress? 4.1. Lowering Levels Of Depression. 4.4. Yoga Helps Reduce Pain. 4.5. Mindfulness May Reduce Heart Problems. 4.7. More Oxygen Can Improve The Brain’s Function. 5.1. Deep Relaxation Yoga Techniques. 5.2. Quick Yoga Relaxation Techniques. 5.3. Instant Yoga Relaxation Techniques. 6. 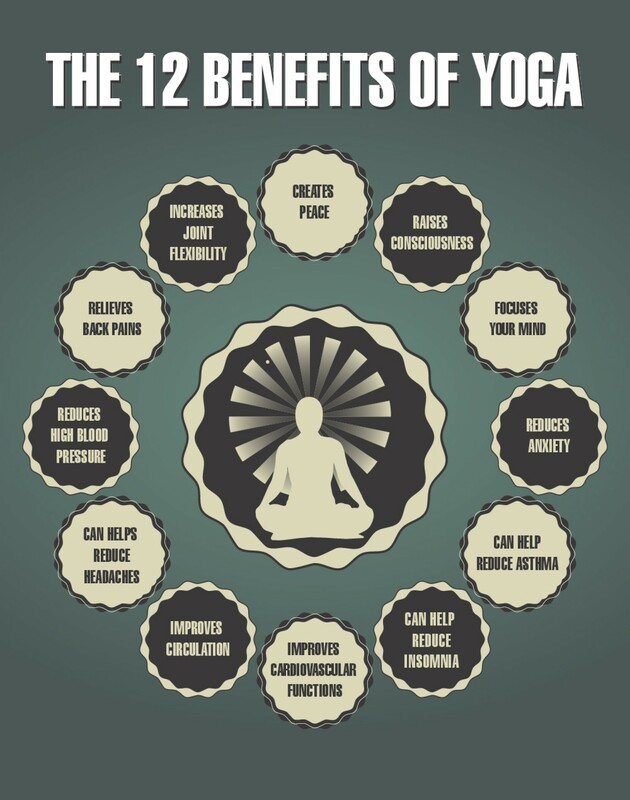 Benefits Of Yogic Relaxation. 7. Disadvantages of Yogic Relaxation. 8.1. What Is Yoga Nidra? 8.2. What Are The Benefits Of Yoga Nidra? 8.3. Conscious Thoughts And Becoming More Aware. We live in a world where stress affects many of us. Whether it’s work, relationships or anything else, we all feel stress. And the problem with stress is that it can negatively affect our mental, physical and emotional health. The tension, feelings of overload and internal conflict of stress can become overwhelming. That’s how yogic relaxation can help. Tip: If you’re wondering just how damaging stress can be, check out my guide to stress management. Yogic relaxation is the technique of using yoga to de-stress and calm the mind. Essentially, yogic relaxation can be achieved with breathing techniques, posture activities and meditation. It was originally developed in India, from the religions of Hinduism, Jainism and Buddhism. The practice of yoga focuses on balance, posture, breathing, stretching and relaxation. Yogic relaxation is a holistic activity. Whilst yoga is commonly recognised for being a physical activity with complex poses, the yogic lifestyle goes far beyond postures. And that’s why yogic relaxation is such a beneficial activity for stress. It’s a way of life that’s focused on healing the body and mind. Yogic relaxation techniques can significantly reduce your stress levels. In the next section, we’ll look at some scientifically backed research explaining how this works. But for now, let’s focus on the philosophy of yoga and how it can reduce stress. Here’s a few examples of how yoga techniques can help reduce stress. Ever had someone tell you to take a deep breath? By taking slow and deep breaths, yoga can reduce your body’s levels of the stress hormone cortisol. This slows down your sympathetic nervous system. By increasing your brain’s supply of oxygen, your brain’s function can improve. Plus when you feel stressed again, you can rely on this technique to help you. Note: Chronic stress and excessive levels of cortisol can damage your health long-term. It’s undeniable, a lack of sleep can leave you irritable and stressed. Unfortunately, this creates a vicious cycle. The less sleep you have, the more stressed you feel. And the more stressed you feel, the worse your sleep becomes. Yoga can help you break this cycle. By reducing your stress with yogic relaxation, you improve your ability to sleep. Most of the time, we feel stressed because there’s something troubling us. But this sense of inner conflict is typically caused by either ruminating on the past, or worrying about the future. This is how yoga’s practice of mindfulness helps. Mindfulness is a technique that empowers us to focus on the present moment. Instead of being preoccupied by stressful events, we can free our minds to concentrate on the beauty of the present moment. Mindfulness can also improve your heart’s overall health too (as explained by Harvard Health Publishing). With the physical postures of yoga, we release endorphins. Endorphins are feel good hormones our body produces when we’re doing physical exercise. Of course, it’s not the only way to exercise. But many sports and high intensity physical activities such as lifting weights or running, can actually cause a spike in cortisol. This can temporarily increase your body and mind's stress levels. The charm of yogic relaxation is that these postures are low intensity. Therefore your body still releases endorphins, but you’re no longer straining your body with high intensity exercises. All of the above benefits sound great. But you may be wondering where are the proof points behind this? And are there any scientifically backed studies where yogic relaxation is proven to reduce stress? Personally, I don’t believe everything I read. I often worry that the hype of relaxation techniques is often caused by marketers, instead of being health and fact based. 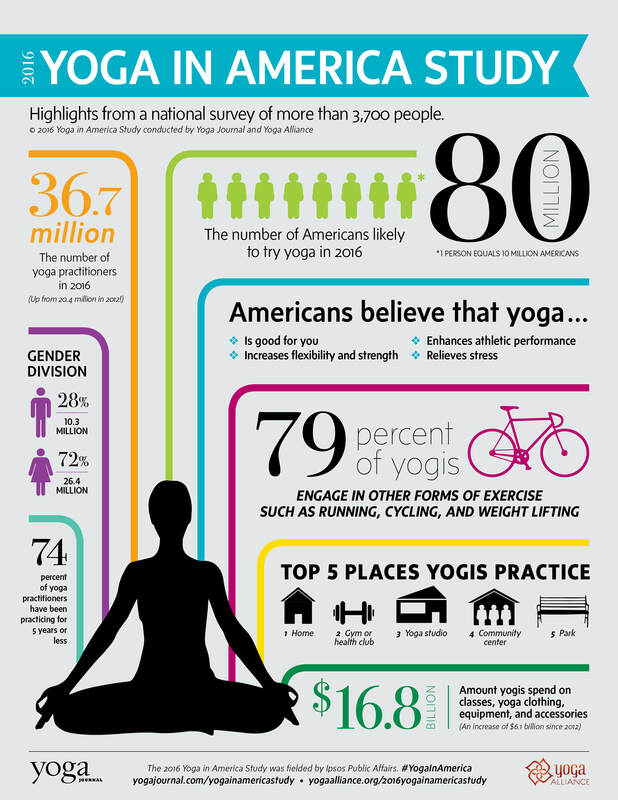 So instead, here’s some data driven research identifying the benefits of yogic relaxation. This study was conducted on 21 male veterans, who attended a yoga class twice a week for 8 weeks. The classes involved breathing activities, mindfulness and physical exercise. By the end of the study, the participants had scored lower for depression. The research showed that yoga can help reduce emotional eating problems and lower levels of depression. The mental health benefits were impressive, with participants reporting a reduction in negative emotions, problematic thoughts and negative behavioural patterns. The scientists behind the study actually decided that this improvement had a strong correlation with the mindfulness benefits of yoga. Yoga may also reverse and repair DNA reactions that cause stress. In fact, this study discovered that yoga reverses DNA molecular diseases caused by depression and anxiety. The research was conducted across 846 participants, over an 11 year timeframe. This phenomenon is known as Mind-Body-Intervention (MBI). You see, yogic relaxation is focused on creating a balance between the mind’s thoughts and the body’s wellbeing. Essentially, when we feel stressed our body reacts by activating the Sympathetic Nervous System (or in the other words, our fight or flight response). You’ve probably experienced this already if you’ve ever faced moments of panic, severe stress or danger. When our Sympathetic Nervous System is activated, our body uses a nuclear factory called kappa B (NF-kB). So when we feel stressed, this nuclear factory expresses our genes by producing proteins that cause inflammatory effects on a cellular level. In the long-term, these inflammatory effects can leave us exposed to related diseases such as depression and cancer. However, the study discovered that the whole process was reversed with the help of practicing MBI via yoga. Participants actually experienced anti-inflammatory effects, reducing their exposure to inflammatory related diseases in the long-run. The anti-aging industry is one that I’m skeptical about. I feel like stress could reduce the physical effects of aging but there’s so many cosmetic products, surgeries and marketing gimmicks in the world, that I tend not to believe anything I read. However, stress can damage the skin and cause aging. In fact, some studies basically suggest that yoga slows down the effects of aging. Well, a study by NCBI says that Yoga and Meditation based lifestyle intervention (YMLI), reduces cellular aging. Cellular aging is closely related to diseases such as depression, cancer, cardiovascular diseases and infertility. The research was conducted on 96 people (aged 30-65 years old) over a 12 week period. The connection between the pain we feel and our body’s overall conditioning is obvious. The better shape we're in, the better we feel. And as discussed earlier, the inflammatory problems caused by higher levels of stress can leave us vulnerable to long-term diseases such as cancer, cardiovascular disease and aging. In this study, yoga acupuncture was indicated to alleviate neck pain, back pain, headaches and migraines. The study was tested between participants who received a placebo treatment, and those who received actual acupuncture. The results revealed that yoga acupuncture is particularly effective for reducing back pain. Mindfulness can improve your physical health, especially for heart problems. It’s becoming increasingly common to see studies measuring the benefits between the health of the mind and the health of the body. This study found links between yogic meditation and a reduction in heart disease. Well, mainly because periods of meditation and reflection help us to continue ‘heart healthy behaviours’. This could include eating healthier, exercising more often and improving our quality of sleep. Yoga often combines deep levels of meditation with complex physical postures. Plus, whilst mindfulness can improve good habits, it also helps our coping mechanisms. When we’re faced with a stressful situation, mindfulness can improve the way we deal with it. Therefore, with mindfulness we can learn how to manage stress better, and stop it from damaging our lives. There is a significant link between yoga and your overall levels of sleep quality. As yoga helps the mind relax and unwind, we’re less troubled by our thoughts. Therefore we can sleep better, reducing the risk of restlessness or insomnia. Aged over 60, who commonly struggle with sleep deprivation and insomnia. Cancer patients may also benefit from yoga, as 90% experience insomnia whilst undergoing treatment. Pregnant women - studies found that practicing yoga during the second trimester can reduce the frequency of waking up during the night. With deep breathing exercises, yoga increases the flow of oxygen to the brain. Plus when we’re plagued with stress and anxiety, we often struggle to breathe properly. This creates a lack of oxygen, which can further exaggerate our symptoms. Studies have discovered that higher levels of oxygen, enhanced by yogic relaxation breathing techniques, can improve your brain’s function. Whilst the brain only accounts of 2% of our bodyweight, it’s requirement for oxygen is dramatic. Studies have found that as we undertake challenging mental tasks, our brain demands more oxygen. Interestingly, the research found this is also true for glucose. Our brain’s performance increases as we consume more glucose - it can actually calculate two to three more times more effectively if we consume glucose. So now you know why yoga is so beneficial, let’s take a look at a few yogic relaxation techniques you can try for yourself. Instructions of each technique, along with their benefits, are included below. This deep breathing technique is designed to train your mind-body physiology. It works by controlling your breath and increasing your levels of oxygen. This easy yoga pose called can be performed relatively quickly. Simply sit on a mat, with your shins crossed parallel to the mat, bringing your foot underneath the inverse knee. Try to align your feet with your knees. Place your hands on your lap with your palms up. This yoga pose is relatively quick and easy. It’s a simple pose you can use from almost anywhere - from your home, in the office or anywhere else with a bit of space. So how does the cat pose exercise benefit you? 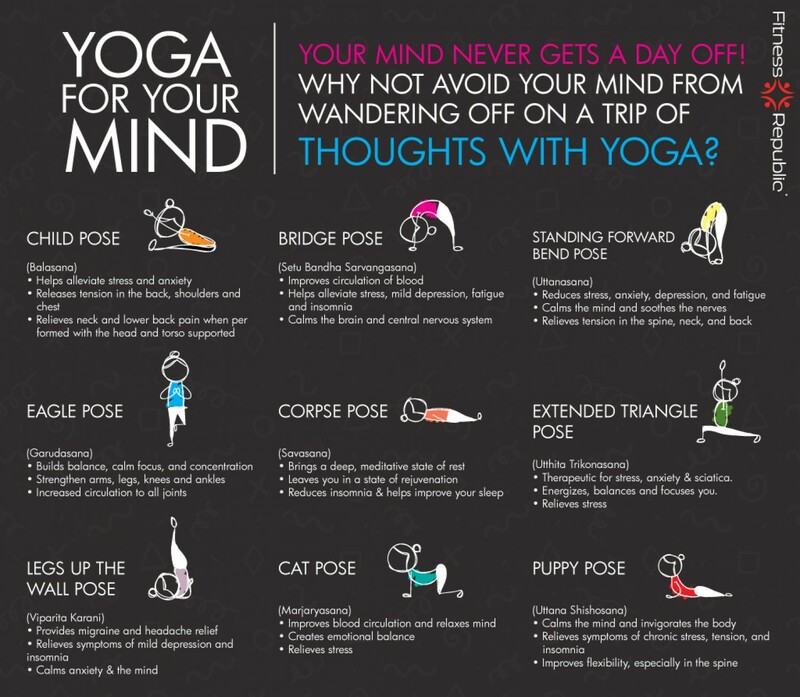 Here's a few more yoga poses that are beneficial for your mind. This yogic relaxation exercise is designed to invigorate your energy levels. Bhastrika is a deep breathing yoga technique that you can perform instantly, whenever you need it. 7. After breathing naturally, breathe forcefully for a round of 20. Then breathe naturally again. 8. After this, complete a round of 30 breaths. 9. Whilst doing all of the above, try to notice the sensations in your body as you switch between rounds of breathing forcefully and breathing naturally. So why is yogic relaxation important? Well, there are many benefits to yoga that you may not be aware of. And with so many advantages, it can become an incredibly rewarding part of life. Improves your overall sense of wellbeing. As a holistic lifestyle choice, yoga can help us become more in tune with our bodies and minds. Reduces stress and alleviates internal conflicts in the mind. Increases self-confidence and your ability to manage challenging, stressful situations. Drives more positivity and enhances your mood. Creates a deep feeling of relaxation and inner calm. It’s versatile. You have a variety of choice between using poses, postures, breathing exercises, mindfulness activities and meditation techniques. As yoga can be practiced in classes, it’s a great social activity. Yogic relaxation helps us bond with other like-minded individuals who are interested in it too. Yoga doesn’t work for everyone. Some people may not enjoy it. You may not have the time to add yogic relaxation to your lifestyle. Yogic relaxation takes patience and consistency to see results. Yoga isn’t a quick fix for stress. It’s better to turn yoga into a lifestyle change. You might need a yoga teacher at first to improve your technique. The physical elements of yoga may be too demanding for some people. In this case, other relaxation techniques may offer a more practical option. There’s a ‘hippy stigma’ attached to yoga. It requires an open mind. If you have any medical conditions such as being pregnant, panic disorder, vertigo or a hernia, yoga is not recommended. Yoga nidra is a deep yoga relaxation technique for sleep. It progressively moves the mind through deeper levels of sleep, so that as you drift off into a slumber, your mind becomes less and less preoccupied by worrying thoughts. This quietens the mind’s brain waves. It’s kind of like achieving deep levels of meditation. However, the difference is that unlike meditation, you don’t have to try to be aware. Typically meditation can be quite a strenuous activity because you have to be mindful and concentrate. With yoga nidra, such focused levels of concentration aren’t necessary. You’re also training your mind to notice your thoughts, and this creates a deeper level of understanding of yourself and how your mind works. So by stepping back, creating some headspace and becoming less attached to what’s going on in your mind, you’re no longer dragged around by your thoughts. Therefore, your levels of relaxation increase. One interesting benefit of yoga nidra is that it changes the relationship between your choices and your thoughts. Essentially, you become more aware of your thoughts. Therefore, you can improve your choices. Let’s say your internal thoughts are suggesting you should eat junk food, or succumb to that pizza craving. Instead, you can take a step back and improve your lifestyle choices. This stops the problematic cycle of bad habits and automatic thought processes. One belief held by yogis practicing this technique, is that your outside circumstances are created by the state of your inner consciousness. So if you want to create change in your life, yoga nidra may help you achieve this. Rather than blaming our external situations, we can look at the root causes of our problems - our thoughts. It can essentially help you take control of the root source of most problematic thoughts. After all, that's where most stress begins.